uChange is the only app that costs nothing and saves your real money every time you use it. 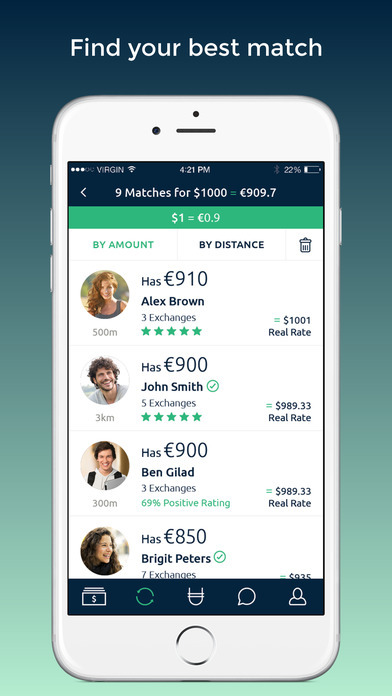 We'll tell you what the real rate is, and then we'll find you a match in your vicinity. Our users are authenticated a number of ways. We verify each users email and phone number, and most users provide a social network account, such as Facebook or LinkedIn that we confirm and you can check as well. Say you're taking a trip to Europe, and you need 500 Euro in your pocket. You download uChange and enter "I need 500 Euro". 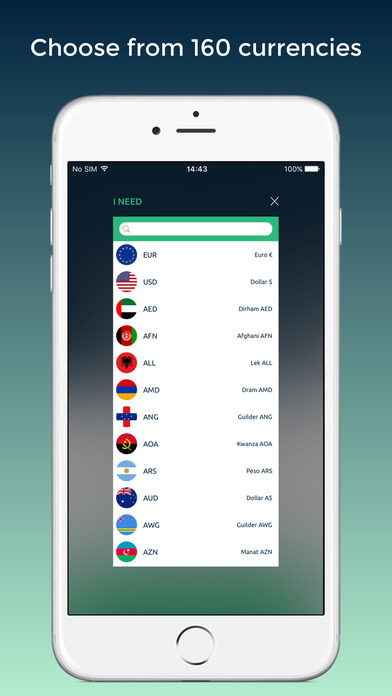 uChange instantly shows you the closest match to your search, in amount and in distance. You then message the match from within the app, and you can mutually decide when and where to meet to exchange currencies. You can also set your search for your destination and thereby plan in advance. uChange currency quotes are provided by one of the most well-respected Live-Quote databases on the market, Open Exchange, giving you the most updated currency rates. It's location feature is powered by a geo-location algorithm, finding you the best possible match in your proximity. We have two levels of users, both completely free. One is a basic subscription, which allows registration in 15 seconds or less. We recommend becoming a Verified User, which takes another minute, but provides a high level of security, and therefore trust. When a search turns up a Verified User match, you will know that the user has been vetted by a uChange professional. It also allows you to check the user's profile in depth and visit their Facebook, LinkedIn or Instagram feeds, so as to provide an extra level of comfort with a trading partner. To actually check the other user's in-depth profile, you need to register as a Verified User yourself. Besides for your increased sense of security, being a Verified User will make people more comfortable with you, and provide more trading partners. So download uChange, save lots of money, and spend it on the things you want! uChange can be used as a convenient currency calculator as well, or just to keep up with Forex (Foreign Exchange) rates.